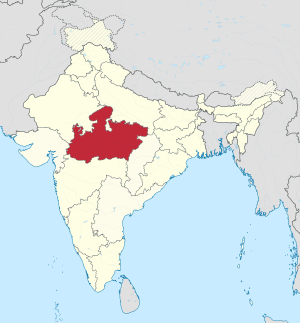 Madhya Pradesh is a state in the Republic of India. The state has an area of 119,016 sq mi (308,250 km2). It is bigger than Italy but smaller than Oman. In traditional Indian geography it falls under the West Indian zone. The capital of the state is Bhopal. The largest city is Indore. Other main cities are Jabalpur and Ujjain. Ujjain is well known for mythological reasons. Mandav, Bhojpur and Panchmadi are the main tourist attractions. To the north of Madhya Pradesh is the state of Uttar Pradesh and to the northwest is the state of Rajasthan, while Maharashtra is to the southwest. Madhya Pradesh Facts for Kids. Kiddle Encyclopedia.